It is easy to overlook an albino wallaby in a black and white photograph, particularly when it has its back to the camera. Against a pale background and partially hidden behind a swallow, a duck, and a rabbit, the ghostly white blob could be mistaken for a mishap of nineteenth-century photography. But while the wallaby is definitely not a trick of light and shadow, it remains strangely, tantalizingly, elusive for me. I came across the wallaby years ago while doing research in the library of the Natural History Museum, London. Taken by a Miss K. Marion Reynolds in 1895, the photograph was among hundreds of images pasted into an oversized scrapbook documenting the museum’s exhibits during the 1880s and 1890s. The photograph shows a large case containing more than thirty albino animals including a hedgehog, a hare, two rabbits, a toad, a mole and dozens of birds. 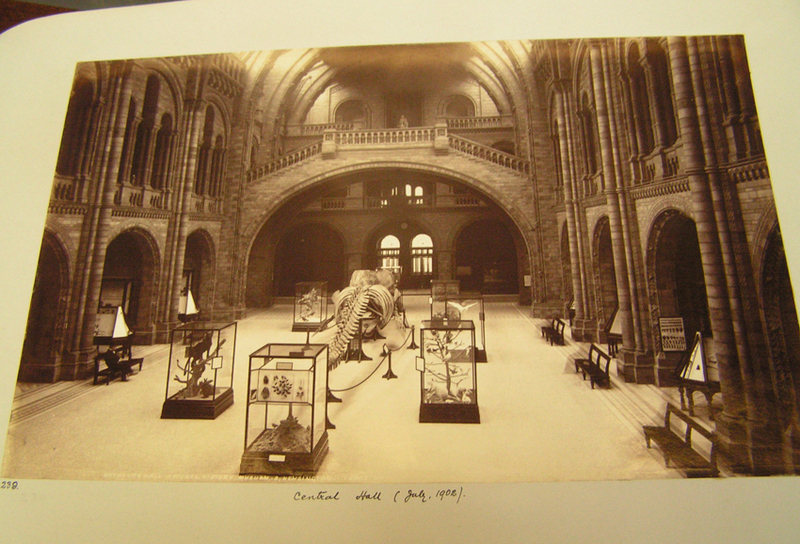 Several other images show the case in context, impressively situated in the museum’s expansive Central Hall. The albino beasts were part of an educational display series designed by Sir Henry Flower shortly after he took over as Director of the Museum in 1883. As the first space visitors encountered, Flower wanted to fill the hall with introductory cases illustrating important laws of natural history, particularly evolutionary theory. 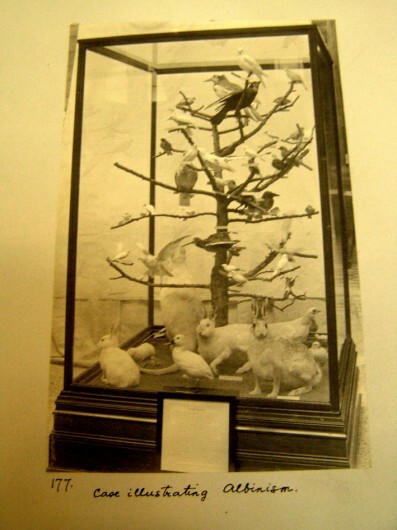 In 1887 the first case (demonstrating dimorphism in goldfinches) was installed. By 1891, six more displays had been added including variation of species under domestication, seasonal variation, environmental adaptation, protective mimicry, melanism, and albinism. I had come to do research on the museum’s early displays, but the nebulous wallaby fascinated me more than anything else. I could have easily missed it completely, but once I had seen its blurry white form, I was compelled to spend the last days of my research trip tracing (and failing to trace) the life and afterlife of the albino wallaby. The wallaby is a Bennett’s wallaby. It was captured alive in Tasmania and came into the possession of Lady Jane Franklin. Lady Franklin had accompanied her heroically unfortunately husband, John Franklin, to Tasmania in 1837. He had been appointed lieutenant-governor of the island, and during their six years in Tasmania the Franklins established the Royal Society of Tasmania. Perhaps someone offered Lady Franklin the wallaby at a Society meeting; perhaps she found it herself. In any case, Lady Franklin deemed the albino wallaby charming enough to present it to Queen Victoria, who kept the animal at Buckingham Palace for some time before donating it to the Zoological Society. This much I know. I do not know whether Lady Franklin delivered the creature in person (the Franklins left Tasmania in 1843) or by mail. Nor do I know when the wallaby was transferred to the Zoological Society’s gardens. Although the lifespan of many exotic imports was disastrously short, wallabies tolerated the English climate surprisingly well – even breeding successfully – which means the wallaby might have survived several years. However, the wallaby is not mentioned in the Zoological Society’s lists of living animals living – I examined 1841, 1843, 1845, 1846, 1848, 1850, 1851, 1854, 1855, and 1856. Nor was it listed in the Natural History Museum’s Catalogue of the Marsupial and Monotremata published in 1888, although surely it was dead and mounted long before then. And most importantly, I have never had the time to figure out whether the specimen still exists or not. Perhaps I prefer the mystery of the barely-there albino wallaby.